Now available! Published April 2015. Wendy Karasin is a divorced baby boomer in the process of losing two parents and in danger of losing parts of herself. Sandwiched between the growing needs of her aging parents and her four young-adult children, she must surrender to a power greater than her own. As this daughter’s reality shifts from denial to presence, a personal, pensive, and thought-provoking journey ensues. With the Baby Boomer population at 79.6 million (Population Reference Bureau) and the senior population at 40 million (National Hospice Foundation), the time has come for conscious, end of life, conversation. when does the book come out. where can i get it. titled, Passing Through. There is a link in many of the posts. You might be able to pre-order on that same site. I wish I had an answer to both your questions…When does the book come out? – and – Where can I get it? Stay tuned…and thanks for asking. 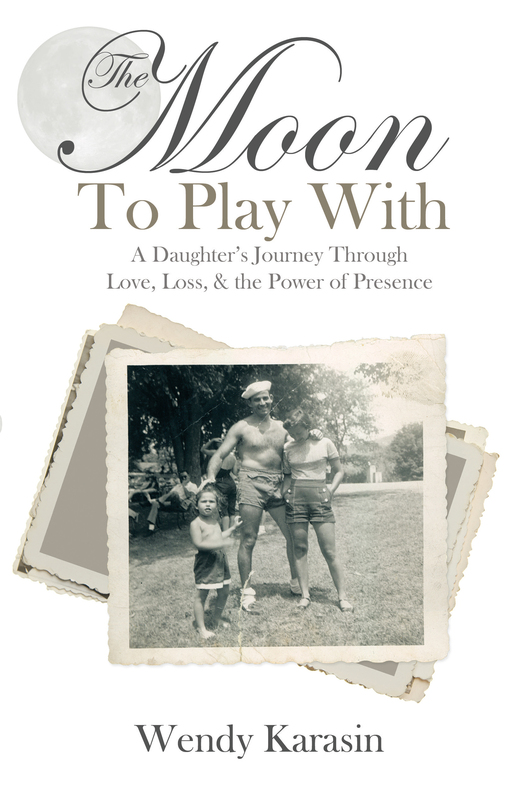 Toni – the book, titled: The Moon To Platy With, A Daughter’s Journey Through Love, Loss, and the Power of Presence – was published in April of 2015. It is now available on Amazon or can be ordered from Barnes & Noble. Grab a copy and let me know your thoughts! Thank you. I am so sorry, I JUST saw this…the book has not yet been published, but stay tuned, so I can let you know when it is. Thanks for asking. Excellent, Wendy–I really like this version of your synopsis! Well done! I have a feeling I’ll be following your writings quite closely. I too am a Boomer and have gone through, and going through, many of the same things you are. It’s good to get acquainted with you so far away and yet so close. I appreciate your kind words, and I understand what you mean about far away and yet close. It’s one of the good things about being a writer, blogger, in this day and age. Welcome. dezertrat4 – just so you know, my memoir is now available to purchase on Amazon or can be ordered from Barnes & Noble. I like the way you write… I am sure the book will also be an interesting piece.. Is the book out? Thank you, I appreciate that. The book is in production. Hopefully ready Nov-Dec. The book is out! Published in April, 2015 – and can be ordered from Amazon or through Barnes & Noble. Thanks for asking and do let me know your thoughts. I’m writing a book that’s a compilation of essays about the effects of the loss of one’s immediate family in a short period of time. There’s something about us baby boomers and our parents that seems magical. Cannot wait to get this book once it’s published. Also, am helping a dear friend promote a book she’s self-publishing. Any suggestions as to where I might find the most useful information and how to drill into your head 🙂 ?! Oh boy, we do have a lot in common. Where do you live? Might be easier to talk on the phone. More private and easier than texting! Your thoughts? Agreed. Am in Chicago. Is your email address on your blog? and share your thoughts about the book with me. Thanks, Jan.
Got it on Kindle! Cannot wait to read it! Please let me know what you think (feel free to review in Amazon), and thank you so very much!